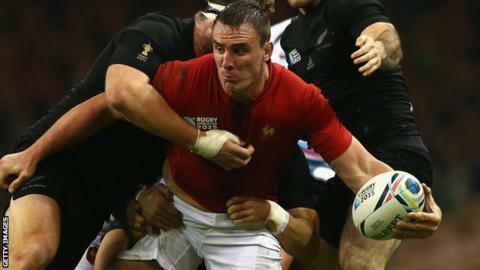 France and Toulouse number eight Louis Picamoles is to join Northampton Saints for the 2016-17 season. The 29-year-old has won 51 caps and scored a try against eventual winners New Zealand during the World Cup. He helped Toulouse win the 2010 Heineken Cup and the Top 14 title in the following two years. "Louis is a world class player and a proven performer at the highest level of club and international rugby," said Saints director of rugby Jim Mallinder. "He was France's standout performer at the World Cup and we're excited by the prospect of him linking up with the quality players we have here already." Picamoles spent seven seasons at Toulouse, following five with Montpellier. "He is still young and we believe that his best years are still to come," added Mallinder. "When we met it was clear that he has the drive and ambition to improve and be successful, and we're delighted that he will be doing that here with us at Franklin's Gardens. "Louis is a fantastic addition to the squad and his signing is a real coup for the club as we look to continually improve and compete at the highest level, both in the Aviva Premiership and in Europe." Picamoles started all five of France's matches at the World Cup and has scored seven tries for his country. "It is going to be an honour to become part of a club as prestigious as the Saints," Picamoles said. "I'm really looking forward to learning more about the club, my future team-mates, to play in the Premiership and to immerse myself in the English culture, especially my first big derby against Leicester. "I'm really ambitious to win titles and I'm convinced that I will do this with the Saints."